Corbyn supporters at a rally in Bradford. Photo by Mischa Wilmers. As the UK’s Labour party leadership contest comes down to the wire, veteran left-wing member of parliament (MP) and surprise frontrunner Jeremy Corbyn has mobilised thousands of young people in support of his campaign. If he doesn’t make it to 10 Downing Street, his straight-talking anti-austerity approach has at least renewed youthful involvement in UK politics. While those on the right of the Labour party warn that Labour under Corbyn could never win a general election, an opinion poll conducted in London by YouGov shows he is the most popular candidate among the wider electorate, with young people most likely to select him as their favorite choice for Labour leader. George Aylett, an organiser for Corbyn’s campaign, told Equal Times that Corbyn’s popularity is the result of tapping into a widespread feeling of alienation from mainstream politics. “The problem in politics is that so many young people have been put off by it, politicians aren't offering policies to benefit them. In response they choose not to vote, therefore politicians will not offer policies to benefit young people because they are not perceived to hold the balance of power. Campaigners argue that the UK government’s austerity policies - which include scrapping the education maintenance allowance and implementing cuts to mental health services - have had a disproportionate effect on the young. And with the latest figures published in August showing youth unemployment has risen to 16%, many young people feel they are being listened to by a frontline politician for the first time in their lives. Last month Corbyn launched his document ‘A better future for young people’ at one of a number of packed events he has been hosting across the country. The document was written following a consultation with young supporters and outlines a number of policies, including scrapping university tuition fees, restoring student grants and reducing the voting age to 16. “Before Jeremy Corbyn announced his candidacy I had despaired at the contenders. To be frank, I did not feel connected to any of them; their policies and their priorities were not right,” says Umaar Kazmi, an 18-year-old student and one of 15,000 volunteers to have signed up to Corbyn’s campaign. Jess Green, a 26-year-old self-employed writer and performer agrees. “He comes across as being honest and normal and just 'one of us'. I think people trust him. You don't get the sense that he's always trying to worm his way out of answering something or hide something from you. Corbyn’s rapid rise and popular appeal to young people echoes similar movements around Europe, including Syriza in Greece and Podemos in Spain. 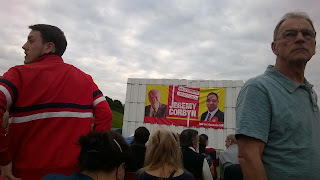 “The Jeremey Corbyn campaign has politically inspired tens of thousands’ of young people who are desperately seeking an alternative to austerity and want to be active in the fight for social justice.